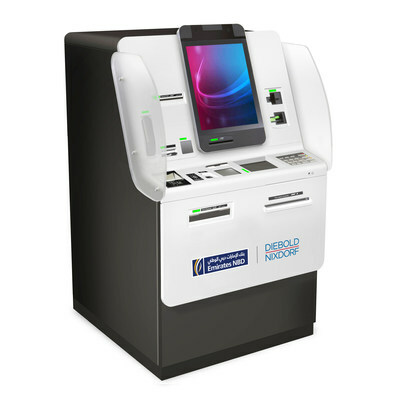 DUBAI, United Arab Emirates, May 29, 2018 /PRNewswire/ -- Emirates NBD, a leading bank in the Middle East, has partnered with Diebold Nixdorf, a world leader in driving connected commerce, to bring consumers in the United Arab Emirates the region's first integrated, digital kiosk. The device allows customers to sign up for new products and access a variety of bank services, functioning like a mini-branch that is open beyond normal banking hours any day of the week. Emirates NBD EasyHub is enabled by Diebold Nixdorf's Vynamic™ Connection Points, a flexible, multi-vendor self-service software allowing the implementation of customized applications. EasyHub offers customers a self-service banking experience aided by a video banker who guides them via onscreen instructions and step-by-step assistance. EasyHub enables individual customers to open accounts of their choice and instantly obtain a personalized debit card. Customers can conduct all routine teller services, such as cash deposit and withdrawal, check cashing and deposits, and internal fund transfers. Additionally, customers can carry out a variety of banking services, such as updating their personal details, requesting a checkbook or authenticated statements and even applying for a personal loan, without having to wait at a bank counter. "Emirates NBD has always made bold investments in digital technology to modernize and simplify banking. Our partnership with Diebold Nixdorf is another example of this commitment," said Abdulla Qassem, group chief operating officer, Emirates NBD. "EasyHub embodies our customer-first approach and will provide increased flexibility to open an account or conduct teller transactions in a safe and secure manner while experiencing the same superior service customers would receive at any of our branches." "Emirates NBD EasyHub is another example of the bank's tech plus touch philosophy that combines digital convenience with the comfort of human touch," commented Suvo Sarkar, senior executive vice president and group head, Retail Banking and Wealth Management, Emirates NBD. "Starting with the launch of the first Interactive Teller Machine in the region a few years back, to introducing EVA (Emirates NBD Virtual Assistant) AI-powered voice assistant and FaceBanking video banking, Emirates NBD has been seamlessly combining digital with the physical to provide a superior customer experience." The innovative solution comes equipped with a debit card dispenser, biometric signature pad, an A4 document scanner and statement printer, a specialized ID card reader, a cash recycler and coin dispenser as well as a near field communication receiver for contactless transactions. "We are honored to partner with Emirates NBD to collaboratively innovate in introducing the region's complete digital customer onboarding solution and help empower the bank's digital transformation journey," said Habib Hanna, managing director, Middle East, Diebold Nixdorf. "We partner strategically with our customers to build customized solutions that fit their current-state and future-state needs, and our innovation team brings these unique designs to life." The bank currently has 228 branches and 1057 ATMs and SDMs in the UAE and overseas and a large social media following, being the only bank in the Middle East ranked among the top 20 in the 'Power 100 Social Media Rankings', compiled by The Financial Brand. It is a major player in the UAE corporate and retail banking arena and has strong Islamic Banking, Global Markets & Treasury, Investment Banking, Private Banking, Asset Management and Brokerage operations. The Group is an active participant and supporter of the UAE's main development and community initiatives, in close alignment with the UAE government's strategies, including financial literacy and advocacy for inclusion of People with Disabilities under its #TogetherLimitless platform. Emirates NBD Group is an Official Premier Partner of Expo 2020 Dubai. For more information, please visit: www.emiratesnbd.com.